How to Prepare for Software Developer Interview? Giving interviews is very common in the midst of this heavily competitive industry called information technology (IT). And one of the common job roles anybody can find in almost all the computer manufacture industry or any part of technological services in the world is a software developer roles. Preparing for a software developer role is not very difficult, it just needs some extra effort and some smart moves to crack the interview. You after completing your graduation or you, an experienced candidate preparing for this interview is almost same but has only slight variations. Hope this post helps you to get a clarity about how to prepare for a software developer interview. Who is a Good Software Developer? Software developer is someone who is responsible for the design, overall concept, testing and maintenance of any software product. Most of the computer manufacturing companies hire software developers for purposes of software development. They also take care of the maintenance of support systems, predetermined operations of the operating systems, applications and overall database management system. Most of the software developers design and create their own software programs for the products which need a software visualization. Most of the business products have a software version as everything is information technology based. Before preparing for the interview try to understand software Developer Responsibilities which fascinates you more in the various functionalities of a software developer. Like for example there are various parts like analysis, design, testing, documentation and project management. Focus on your liking and prepare thoroughly and highlight it in the interview. 1. Mastering the basics of software. 2. Analyzing the overall software product of the applied organization. 4. Tips for the D- day. In order to crack a software developer interview and before getting into knowing the organization, every candidate be it a fresher or an experienced have to master the fundamentals of software. This is very important for any software developer as the whole lot of job role is surrounded by this skill. Learn at least one programming language and have a good hold on it to solve any kind of logical question given to you. Start with coding a simple piece of code and try to break into pieces and understand to solve them. Practice coding daily to improve the efficiency and to solve any complex scenarios. Problem solving skill and algorithms is the biggest part of software developer skill set. Any employer who is hiring a software developer would expect the candidate to know about the basic logic behind problem solving and fundamentals of algorithms field. It is not very difficult if you practice it from scratch. Most of the software developer job interviews always include one or two questions about solving a problem and also about writing algorithms. Do practice daily and increase the habit of writing algorithms. If you are an experienced candidate, this part is very important. There are two things which have to be taken care while preparing for a software developer role apart from the basic steps. They are overall system design and analysis of software products of the applied organization. This part of preparation is very important for an experienced software developer. It is very important to understand the requirements of a software product or a system. Experienced candidate will be expected to describe the whole process of a software development cycle. There are also few categories like mastering the operating systems process, good knowledge about databases and also network concepts. Always do a basic research about the software products of the organization which you have applied for the interview. Do a thorough understanding about the running software products, its design, its features, about its new update and also about the testing of the product. This might help the interviewer to gain confidence about your involvement and also about your skill set. Make sure your font size is between 11 to 12 at the maximum to not make it too big or too small. And also the font style should be very standard ones like Arial or times new roman. No fancy kind font styles will impress the interviewer. For a software developer there are very common objectives to be highlighted. Do not write very vague objective like a student. Make sure you write your objective related to software developer requirements. And use standard terms as it does not look too fake. There is a lot of different opinions about the number of pages for a resume all over the world. Few people tell it can be lengthy and other side tells it should not have two pages. But the standard number pages differ for freshers and experienced. It is always good to stick to two pages or maximum three pages. Use either bullets or numbering list. Do not use both alternatively as it will look cluttered and not very professional. Professional resumes should always have the proper listing. Always make sure your resume highlights your skill set and gives importance to it rather than your co-curricular activities or personal interests. Please do not include all these extra-curricular information if you are an experienced candidate. For freshers, limit it to a minimum. There is a lot difference between a fresher resume and an experienced resume. If you are an fresher, write your resume totally oriented to education background and skills set related to software field. If you are an experienced candidate, highlight your previous experience as well as explain your project experience in your previous organization. This is very important in resume preparation. The very first step in impressing the interviewer is to talk about the organization. So, research about the organization, its products or software systems and over all working model you know about them. In this way you build a rapport with the interviewer as well as show your interest towards the organization. You can always expect that they might ask you to write a code. So, do not panic even if you do not know how to develop the logic to code. Or immediately do not tell I forgot syntax and do not admit I am bad at this or that. You do not know how well the opposite person is in coding. Relax and do what you know about it. Simple tip is to use correct indentations and use lots of white spaces to make it look neat. Prepare this part very well and even if you forget something do not express. Speak clearly and confidently. No stammering or do not use unnecessary expression or comment about your explanation. Make sure you clearly elaborate your project or your skill set in a humble and confident tone. There is nothing wrong to talk about your expectations regarding job to the interviewer. Express what you feel about the job role of software developer. And most importantly if you are an experienced candidate, do not speak bad about your previous job. Talking good things and positive replies about the previous organization will help you gain reputation among the interviewers. In most of the interviews, you can expect lot of questions asking “why?”. So be prepared to and not panic or show stress on your face when there is lot “why” and “what” in the interview. This is very natural as they wanted to see how you deal with multiple questions at a time. Be patient and calm even if you do not know. Try to explain minimum and do not bluff if you do not know anything. Politely express your inability to answer. Finally in the interview, try to express your positivity about the result as well do not force them to tell immediately. Make sure you create a positive feel and show gratitude towards for taking you this far. Every single steps like these counts in an interview process. Any kind of interview needs lots of dedication and preparation. And this is applicable to a software developer interview. Prepare your best and face the interview confidently. 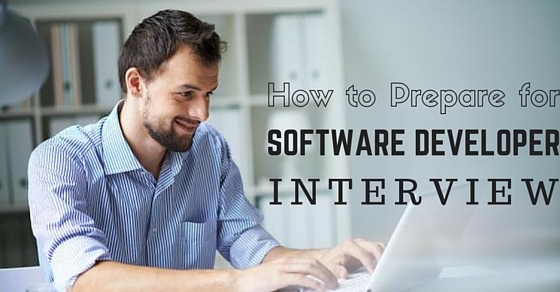 Hope this post helps you to understand how to prepare for software developer interview.